A Mother’s Day tradition of Hale’iwa Sunsires. 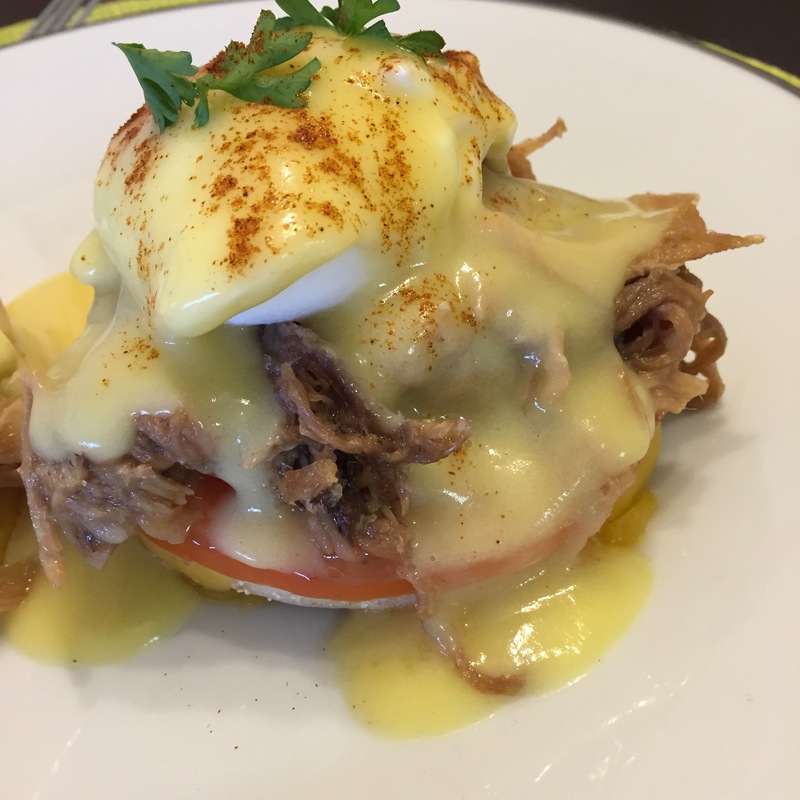 Kalua pork eggs Benedict with cheddar & tomato. Made a diagram a couple years ago. While a picture is worth a thousand words, its not as good for search engine optimization. Arrange your english muffins on a Sheet pen or cookie sheet, and toast em under the broiler for a minute or so. No timer, just watch. seriously. Watch them or they will burn. Take the muffins out and spread some butter (not pictures) on if you choose. was thinking of using lilikoi butter or guava butter, but just used margarine. Place your cheese, we used pre-sliced cheddar, I prefer sharp. Then back into the broiler for melty cheesiness. Again, watch them or you’ll be sorry. Take them out and keep them on standby for platting. Obviously you’ve sliced your tomatoes. 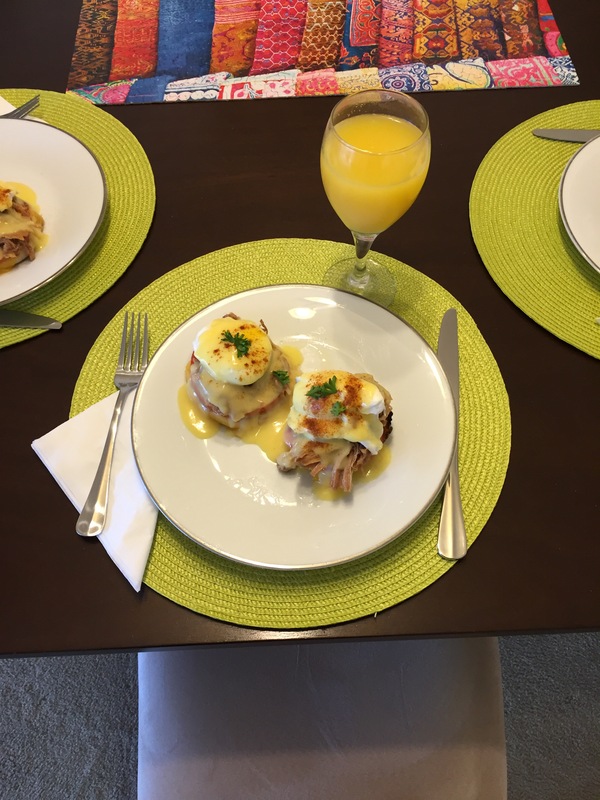 Heated up your kalua pork, chopped some parsley, have your hollandaise ready to pour, and a pot/pan/device ready to poach your eggs. The poaching process is critical to the plating process, so have all your special orders (no tomato, no cheese, no pork, etc) spec’d out. this is where you need your assistant if you’re doing more than 1. One person on the poaching and one for plating. 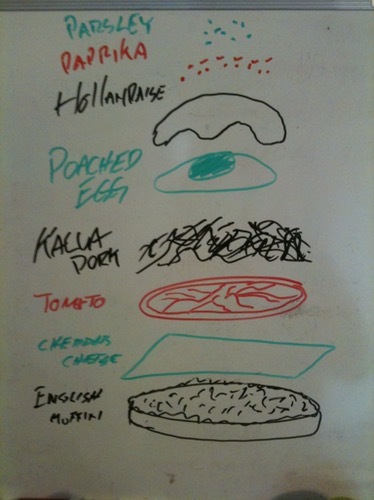 Two cheesy muffins per plate, add slice of tomato, make a big pile of kalua pork with an indentation on the top. Poacher then rolls your poached egg of the paper towel onto your spoon and then roll off the spoon into the indentation of the pork (repeat for other muffin). Plater then pours the hollandaise, dusts some paprika, and tops with a sprig or sprinkle of parsley. 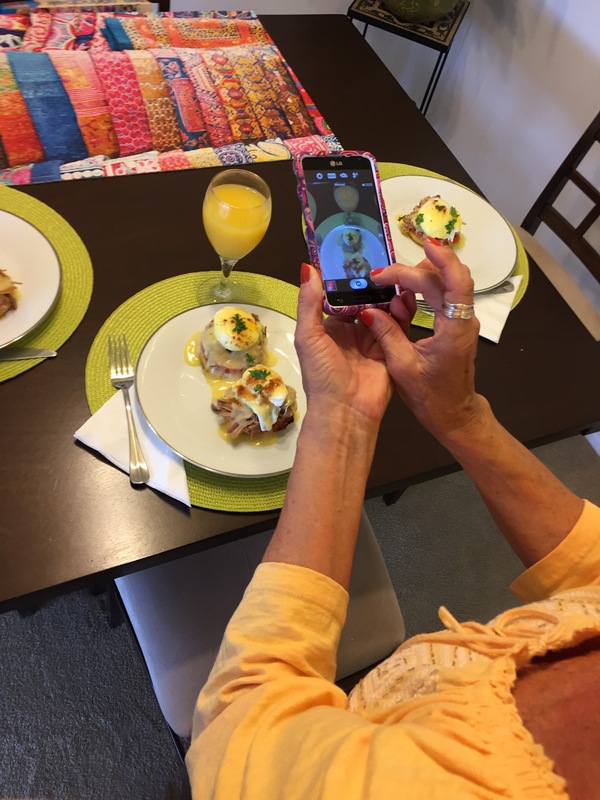 I like taking pictures of Kari taking pictures [future link to metapics], but this time I caught Darla (Kari’s mom) taking a picture so couldn’t resist the mom meta pic. A wonderful job. Super helpful inrmfoation.